The first episode of a three-part saga about Italian-Canadian (they might be American; Italian-North American at least) brothers who can’t get out of each other’s way, inch of your LIFE‘s pilot is a cleanly directed, excellently paced introduction to a memorable set of characters played with verve and intensity by a cast with great chemistry. There seems to be some disagreement about accents and Alex Clay’s snarky gay Luke feels too much like a trope but, for the most part, the ensemble of characters showcased in episode 1 gives the audience plenty of reason to tune in for episode 2 (coming in May). Playwright/director Massimo Pagliaroli’s dialogue is snappy and his drama guiltily pleasurable. Beyond the risky proposition of telling a single story over three separate theatrical runs, inch of your LIFE isn’t quite as complex as I’d like but, because this is only the first part, there’s still plenty of time for the stakes to be raised and the themes to deepen. If Pagliaroli pulls that off, The Theatre Circuit’s inaugural undertaking will prove pretty impressive. 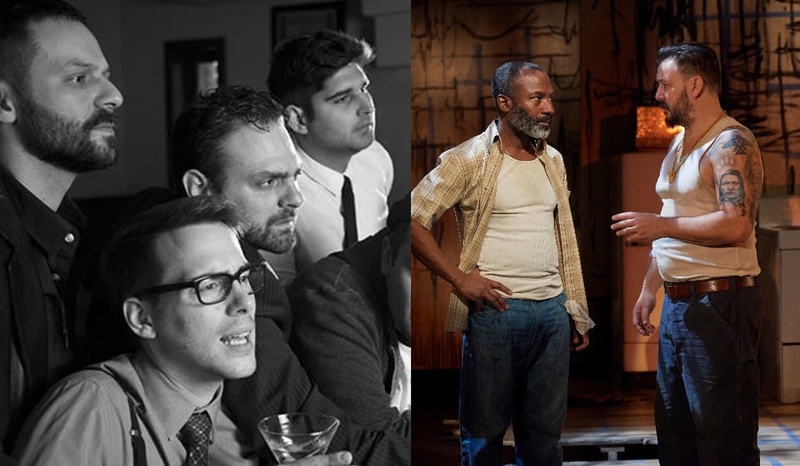 The first thing that needs to be said about Nina Lee Aquino’s reimagining of Michael Healey’s Drawer Boy is that Anishnaabe actor Craig Lauzon and, especially, West Indian-Canadian actor Andrew Moodie deliver excellent performances in extremely difficult roles. There are lots of reasons to embrace diverse casting but to me the biggest reason will always be simply that it widens the pool and, the wider the pool, the more likely you are to find the person who’s going to do the best job. She found the right people, but Aquino’s casting choices go beyond widening the pool- she’s trying to say something about appropriation and erasure and forgotten voices, all really important things very worth saying. The problem is that The Drawer Boy doesn’t say them, at least not intentionally. Healey’s play about a big city theatre kid (an overmatched Graham Conway) writing a play about farmers is pretty blatantly about the magical power of art (it’s based on the creation of TPM’s 1972 play The Farm Show). It’s dated and self-congratulatory, a quality only highlighted by its being programmed as an anniversary production celebrating the company that produced both the text and the text-within-the-text. The play that Nina Lee Aquino is trying to force The Drawer Boy to be is a far better play than The Drawer Boy is. She’s directing a complicated drama that’s heartbreaking on a personal level and harrowing on a cultural one but what Healey wrote is a charming fish-out-of-water comedy about how awesome theatre is. I can’t help but wish that someone would just commission the play Aquino was trying to direct so we can look back at The Drawer Boy as a part of Canadian theatrical history that now belongs in a drawer.